DSA Ocean Grove has its first event this weekend. It’s that time of year again where smiles are well and truly put on dials. Disabled Surfers Association (DSA) provides an inclusive experience for all people with any disability to experience the rush of riding a wave. 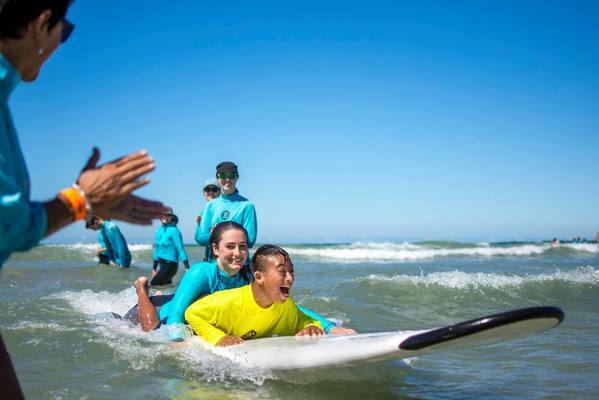 DSA’s Ocean Grove branch has world-class beach facilities that help make the experience as inclusive as possible. It’s the Ocean Grove branch’s 10th anniversary and again they are looking for volunteers and participants. Facilities for participants include special needs changing/amenities; wheelchair ramp access from the car park all the way to the sand; and specialised beach wheelchairs (to suit adults and children). The specialised beach wheelchairs are available for use along the Bellarine and Surf coast free of charge by the community at any time by arrangement. This enables a person with special needs to experience the beach at any time with family and friends all year round. This year’s events are at Ocean Grove main beach on Sunday 3 February and Sunday 3 March. To register as a participant or volunteer, go to disabledsurfers.org/vic/ocean-grove-branch/. Email dsaogsmiles@gmail.com for further event information, register your interest as a volunteer or if you would like to sponsor the branch.